Even though they are small and a bit inconspicuous, Reakirt's Blue (Echinargus isola or Hemiargus isola) butterflies are very common here in southeastern Arizona. 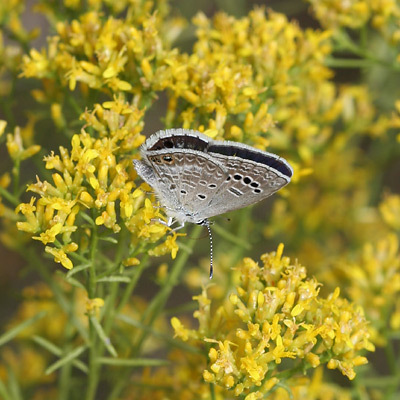 Reakirt's Blue butterflies can be identified by the pattern of six, white-rimmed back dots (usually only 4 or 5 are visible above the hindwings) above a brown-centered, white "equals sign" on their ventral forewings, visible when they have their wings closed. 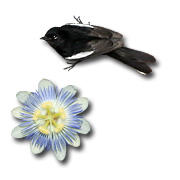 The upper sides of the wings are washed with a pale violet-blue. The Reakirt's Blue butterfly is in the Blues, Coppers and Hairtails Family (Lycaenidae) and the Polyommatinae subfamily, commonly known as Blues due to the usually blue color of their dorsal wing surfaces. 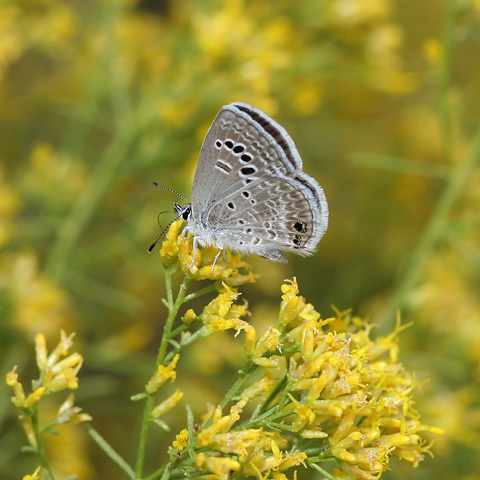 The larvae of these butterflies feed on plants in the Pea Family (Fabaceae), and like the larvae of many other butterflies in the family Lycaenidae, Reakirt's Blue caterpillars have a myrmecophilous (love of ants) relationship with ants. These caterpillars produce chemical signals to communicate with the ants and have nectary organs (honey glands) that secrete sweet fluid as a reward for the devoted ants that care for and protect them.